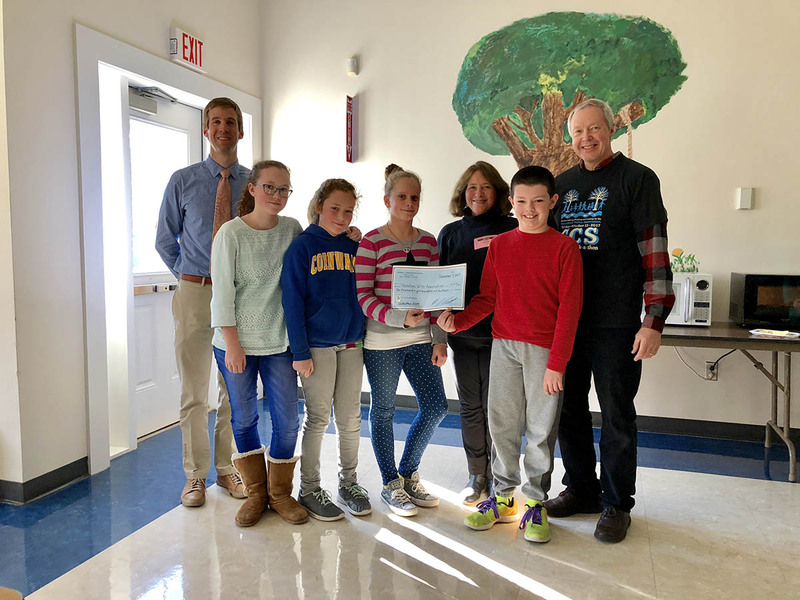 Cornwall Consolidated School (CCS) Principal Michael Croft and students presented a check to the Housatonic Valley Association in a lunchtime ceremony today, donating $1,814 on behalf of the school. The donation resulted from the efforts of students and staff who participated in October’s annual CCS Walk-a-Thon. HVA plans to put the funds to good use, with an emphasis on youth education programs. Both CCS and HVA have a shared interest in shaping the next generation of environmental stewards, including hands-on learning opportunities that get kids up-close and personal with local woods, waters and wildlife. The annual Walk-a-Thon fundraiser divides proceeds between the school’s 8th grade class trip to Washington, DC and a local or international charity determined by a student vote. Previous events have supported the Mekele Blind School in Ethiopia, the Cornwall Volunteer Fire Department and the Jane Lloyd Fund, among many other causes. Cornwall Consolidated School, a K-8 public school, is ranked in the top 3.5% of schools in Connecticut out of 1,248 schools evaluated. It is also ranked A+ academically.